Do you know how many calories white rice and brown rice have? You may be interested in knowing the calories of 100 grams of raw and cooked rice, especially if you are on a diet to lose weight. I’ll tell you everything you need to know about rice and its calories. You know that the Orientals eat a lot of rice. Judging by the low incidence of overweight in the eastern population, we could infer that rice is an excellent food for weight loss. However, it all depends on what type of rice you are dealing with and fundamentally how you prepare it. 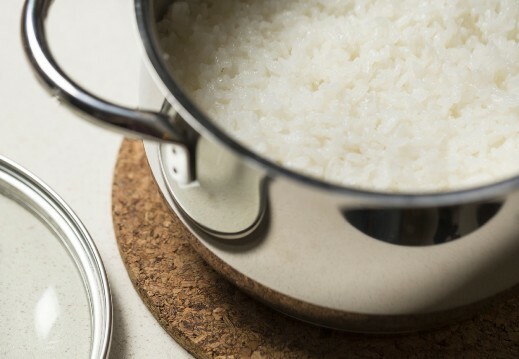 The simplest way to prepare the rice is to boil it. Cooked rice, without any additions, gives you 125 calories per 100 grams. However, keep in mind that if you cook it by steam, it will conserve much of the starch. For that reason, steamed rice adds up to 140 calories per 100 grams to your intake. For its part, brown rice contains not only less starch, but also more fiber. This is so that once cooked, it contributes only 111 calories per 100 grams. When you put it in different preparations the calories go back quickly. In paella, you can add up to 200 calories per 100 grams. However, you can further reduce the calories of rice, if you put into practice the following cooking trick. Boil water until it boiling. Before adding the rice, add coconut oil to the water, about one tablespoon. Cook the rice until it is point. Remove from heat and allow to cool for at least 12 hours in the refrigerator. Thus, rice loses at least 10% of calories. The reason is that this process prevents the starch from converting, providing all its calories. On the other hand, something similar happens when you make fried rice.